Dressed in the modest garb of an observant Jew, Nachum Helig may not be what you’d expect of a farmer, especially if you’re only familiar with the young hipsters of Adamah and Jewish Farm School. However, he’s the fourth generation to till his family’s land in southern New Jersey and he spoke last week at Lower Merion Synagogue, after a showing of the 1993 documentary, The Land Was Theirs. After the assassination of Alexander II of Russia in 1881, the Jews were persecuted and displaced. 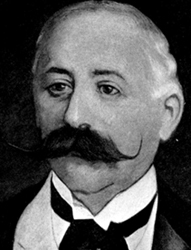 To counter these pogroms with his utopian vision of a better life for Jews, the German-Jewish philanthropist Baron Maurice de Hirsch funded farming communities in Argentina, Canada, and Palestine. He also set up a smaller trust for the United States. Of the 100 Jewish or so farming colonies eventually founded in this country — from South Dakota to Connecticut — the most enduring one was in southern New Jersey. The first group of 43 families arrived in Alliance, New Jersey in 1882. They had no farming skills, but they wanted a healthier alternative to the stifling factory work available in the major cities where most immigrants landed. Land was relatively cheap because the soil was either of a sandy loam or clay — the latter is worse, because it doesn’t drain rainwater — both of a low quality avoided by the experienced farmers. The first year, everyone lived together in three barrack-style buildings. The following year, they divided the land into 15-acre plots and they built two-room houses with a cellar. The colony’s main advantage was its location, 40 miles south of Philadelphia and along the tracks of the Jersey Central Railroad, which carried their produce to markets. Still shot from This Land Was Theirs, The National Center for Jewish Film. It was grueling work for these earliest pioneers, and one elder recalled, “cooperation was key. There was no competition.” Monthly meetings of the cooperative consisted of long, loud arguments, said another elder, by “people whose intellect was 40 times greater than what their [farming] jobs required.” A third senior recalled her father plowing the fields while reading a book propped up in front of him. In the early years, they worked for non-Jews while they learned to farm. Later, the Jews accepted outside funding to build side businesses that generated income: cigar production, garment piecework, and canning. By the 1920s, raising chickens became the profitable source of income, and southern New Jersey became known as the “Egg Basket of America.” Prior to World War II, most egg production came from farm flocks of fewer than 400 hens, according to the American Egg Board. As a boy in the 1950s, Nachum Helig raised steer as a member of the local 4H agricultural youth organization and worried his mother by sleeping in their stalls at the county fairs. At age 10, his father gave him 1,000 broilers (chickens raised for meat, not eggs) to raise; with his earnings, he bought more of his beloved steer. He was already driving a tractor by then, long before he was eligible for a driver’s license. The Helig family became respected members of their community. Helig’s father, Jacob, served as mayor of Pittsgrove Township for 28 years and also a justice of the peace. He built a courtroom in his basement; when the policemen would traipse through his house in their shiny boots, his mother would point to them as her enforcers of good behavior. At the first Yovel (golden jubilee, 50th) celebration in 1932, Isaac Helig, son of the pioneers, Sarah and Simcha Helig, served on the reception committee; at the second Yovel (centennial, 100th) celebration in 1982, Jacob Helig served on the planning committee. Of the fourth generation, Nachum Helig attended Rutgers University, earned a degree in industrial engineering, and served in the United States Army. He remained involved with the farm while working in industry, returning full-time to farming in 1995. At the farm’s peak, the Helig family farm had 25,000 egg-laying chickens, 25 beef cattle, and 80-100 acres of land devoted to corn, soybeans, and hay. These days, his biggest cash crop is alfalfa hay, grown on 70 acres. His newest customer is the Cape May County Zoo, where his hay is favored by the giraffes. Devorah Helig grew up in Vineland as the daughter of a dry-goods merchant and is also a descendent of Jewish farmers who settled in Connecticut. Nachum Helig drives twice each work day to pray with the small community at the Vineland shul, located 7 miles from their farm, but for Shabbat and holidays the Heligs come to the Yeshiva of Philadelphia. A remarkable couple, Nachum and Devorah Helig represent the long tradition of Jews tilling the land while maintaining Jewish practice with integrity.